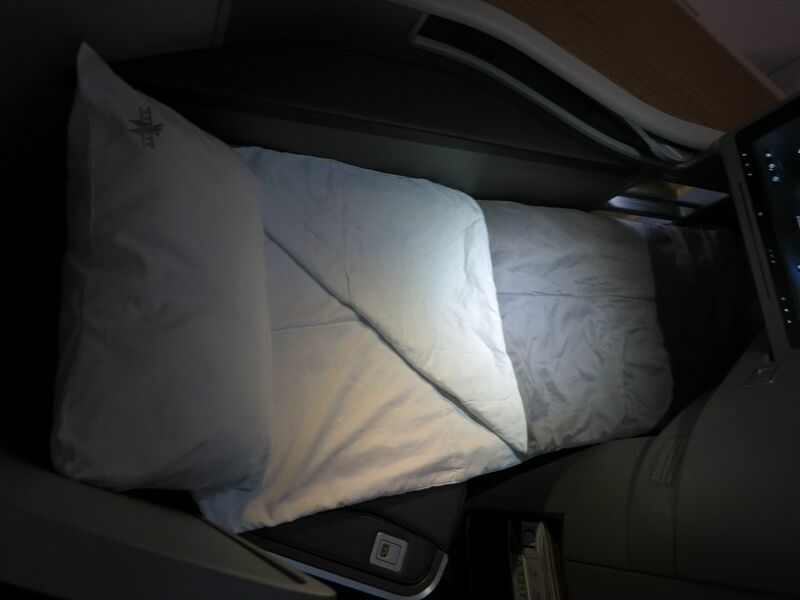 There are (10) first class seats, (20) business class seats, (36) main cabin extra (coach with ~ 4 inches of extra legroom), and (36) standard economy seats. 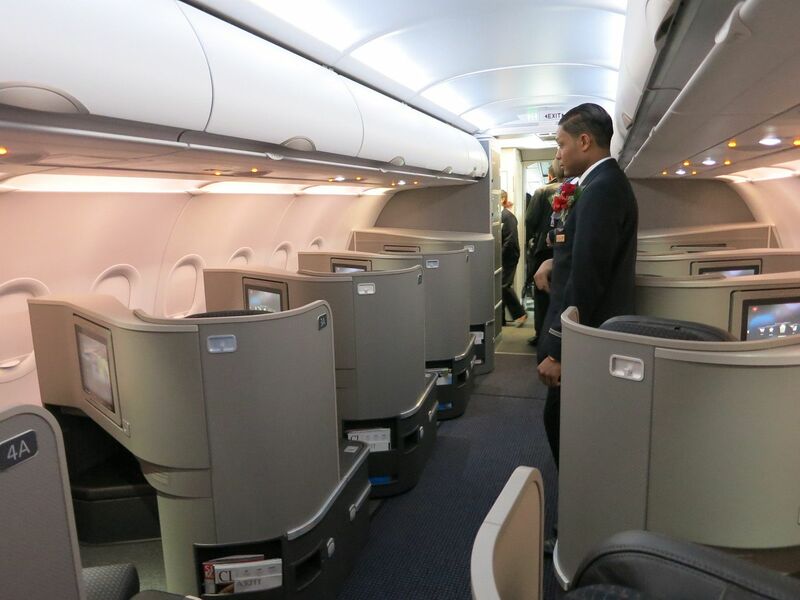 That’s a cabin that’s mostly premium, and an A321 (the ‘stretch’ version of the A320) with only 102 seats. 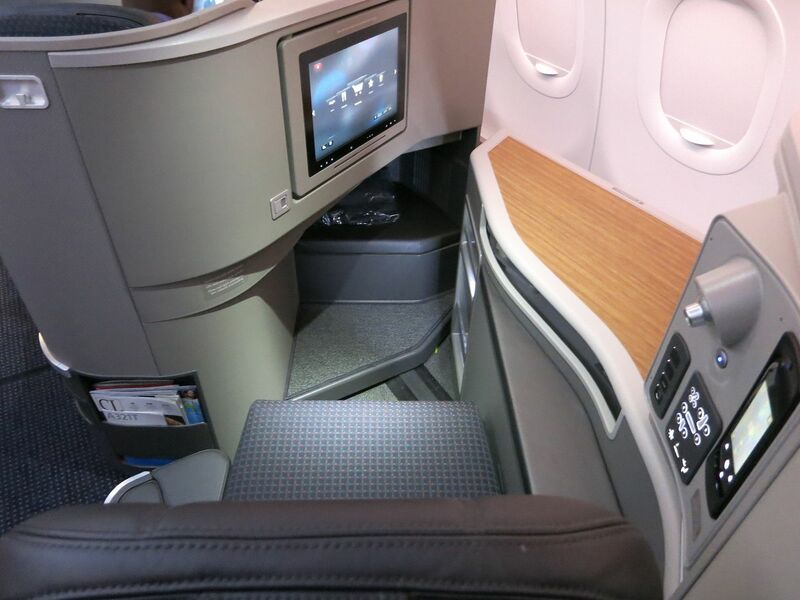 The point of thee planes though is in the premium cabins. 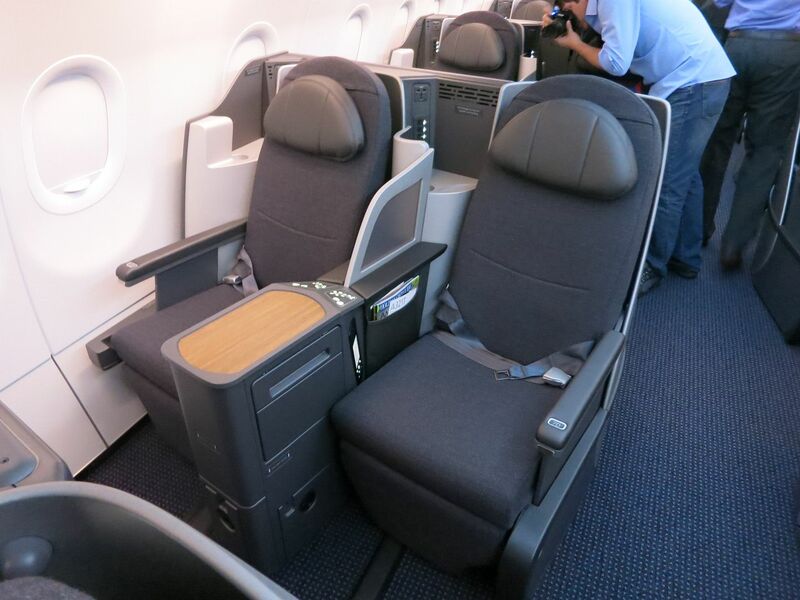 American’s 767-200 premium products are antiquated, a decade old while the competition has updated. 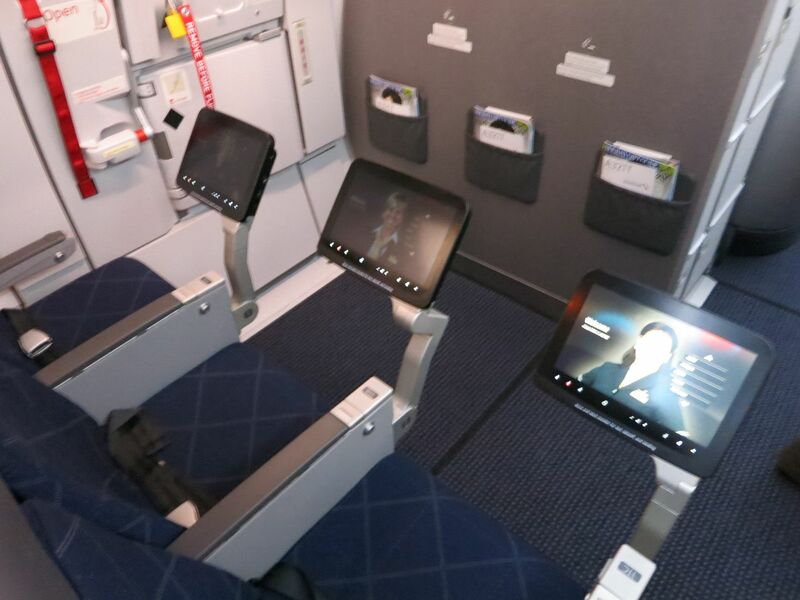 Their new business seat is essentially equivalent to United’s. It’s a fully flat product, and the current service standard includes bedding for the seats, as well as meal service that draws on the same appetizers and entrees that are being served in first (I don’t think they’ve finished decision-making on the soft product elements). Personally I found the bed to be pretty narrow, but that’s more than fine for me as I sleep on my side. 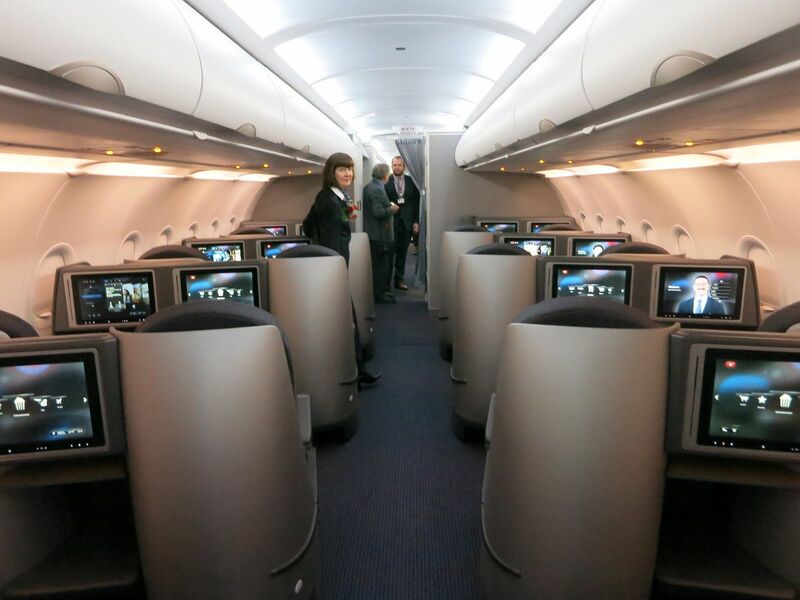 That’s no surprise, really, since they have 5 rows of 2×2 business class seats — fully flat seats in a narrow body aircraft,. They’re meeting the modern industry standard here. Combined with frequency you certainly won’t have premium passengers book away from the product, and many will prefer it. The killer app — and I do think they’ll be able to find enough customers to pay for it to sustain it, since there’s no one else offering it anymore and so no competition — is the first class cabin. 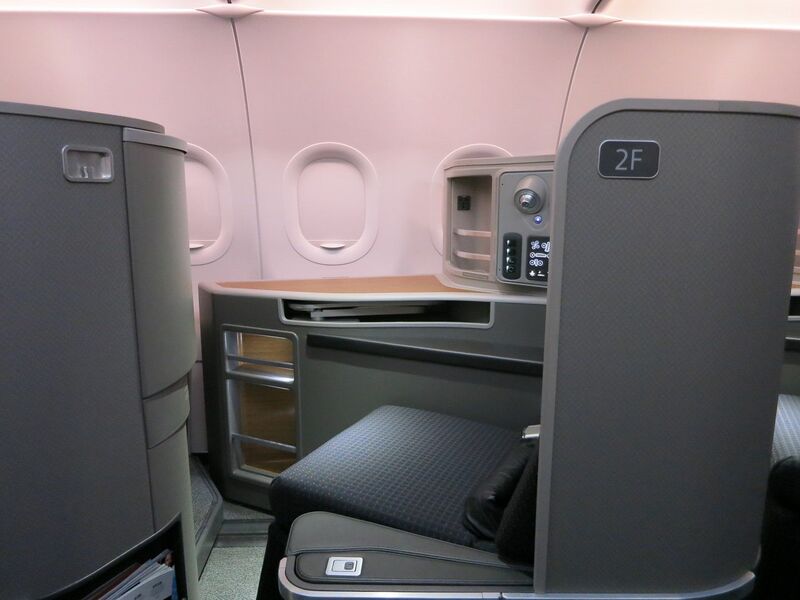 The first class seat is very similar to what American offers in business class on their 777-300ER. 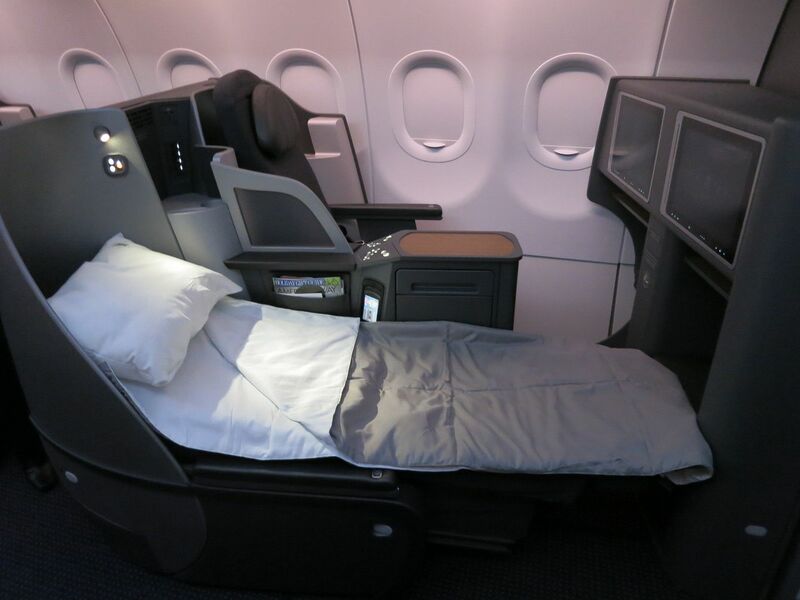 They’re the only airline offering a separate first class cabin in the New York – Los Angeles and New York – San Francisco markets. There isn’t as much demand for first class as there once was, LA moivie studio contracts now allow business class whereas they once required first and business class in many ways is better than first used to be. But with 10 seats per flight not just on American planes but on any planes they should be able to sell to the premium banking and studio markets via corporate contracts, as well as Asian markets — American and joint venture partners serve both Tokyo – New York and Tokyo – Los Angeles and San Francisco and these flights connect those. My initial sense was that the plane didn’t have enough ‘regular economy’ seats, New York – Los Angeles and Sea Francisco are premium routes, but they aren’t only premium. 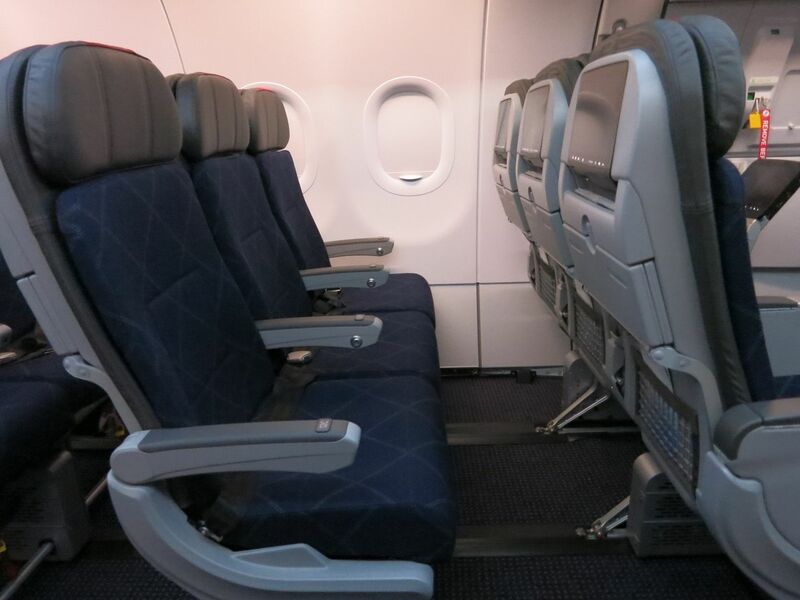 United first introduced its “p.s.” product a decade ago and had their entire coach cabin as economy plus extra legroom seating. They reverted to a mix of coach and economy plus because they weren’t going to be earning a premium on all of their seats. Here’s Wandering Aramean off in the distance opening an overhead bin, and considering jumping inside. While 36 seats of standard coach, and 102 seats per flight, may not seem like a lot the name of the game will be frequency. Fewer seats per flight, more flights, should help them earn a revenue premium as the most convenient carrier in addition to offering a strong product. Coach slimline seats are surprisingly comfortable. 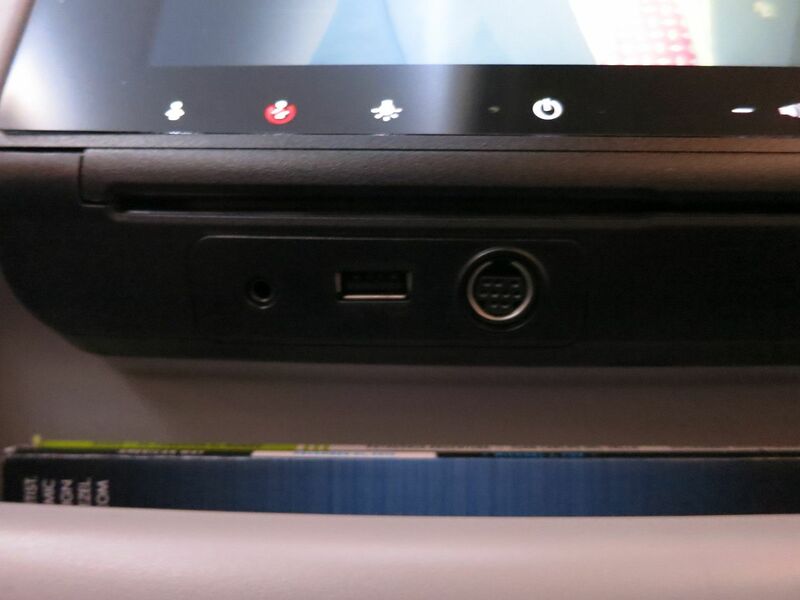 There’s no footrests or cup holders like Singapore Airlines offers in their new (long haul) coach product, but there’s power ports and that new plane smell. The plane is pimped out with inflight entertainment. At a conference last year I heard Doug Parker say that every airline executive cursed the person who invented this idea, since equipment is heavy and expensive — and the future is people bringing their own. 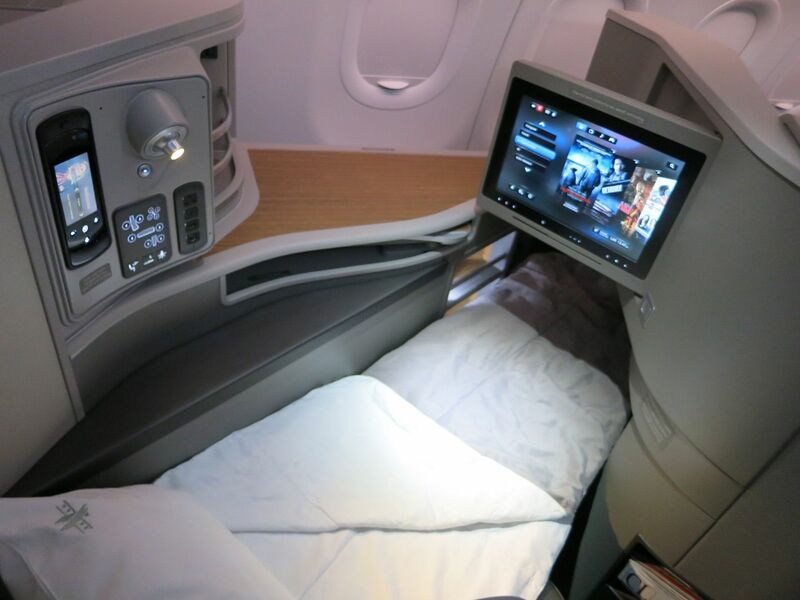 They’ve loaded the system with about 200 movies, 180 TV programs, and 350 audio selections, plus 20 games, This is all complimentary in premium cabins, and business and first class get 15.4-inch HD touchscreen monitors. 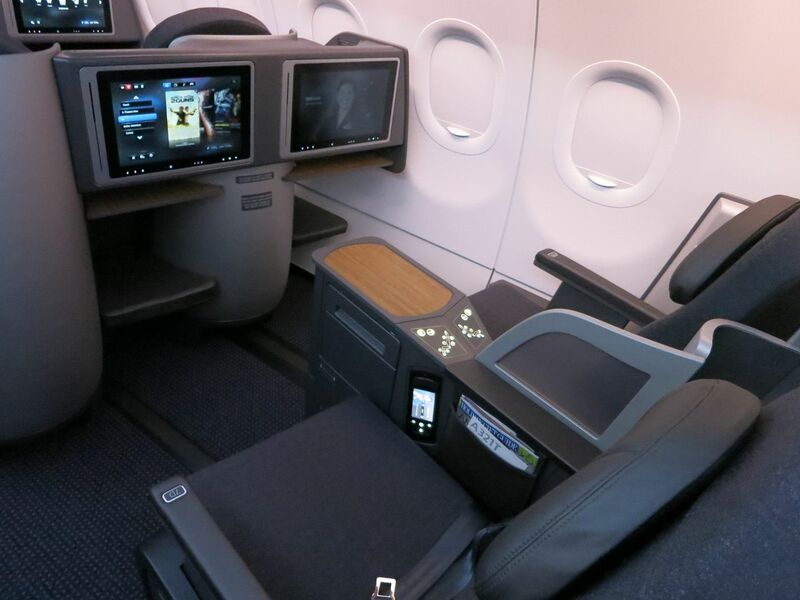 Coach will have some of the content free and some for pay, although it’s all free even in economy March 31, 2014. First flight will be Los Angeles – New York JFK the morning of January 7. There still seats available for purchase! By January 15 there will be 5 flights a day with the new plane. You can identify which flights are scheduled for the new plane by the equipment listing “32B”in the schedule. 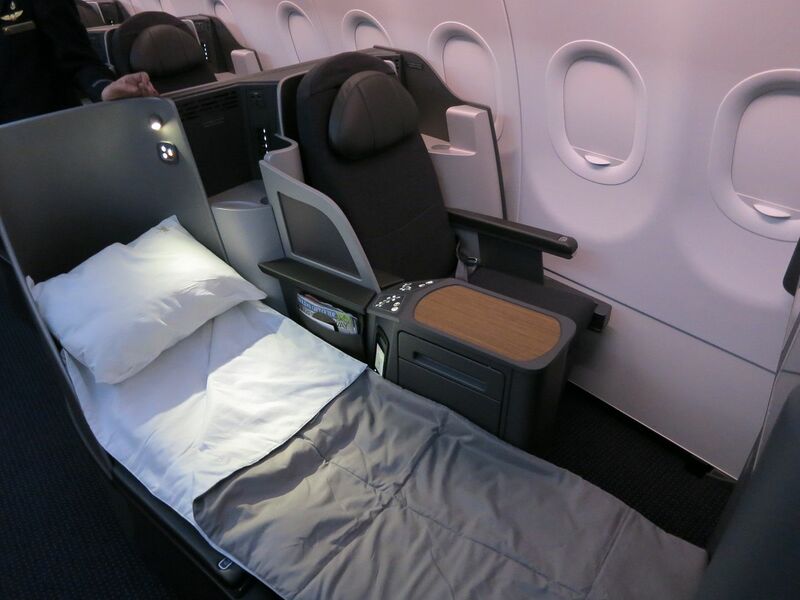 American is offering up to 7500 bonus miles per flight on the route. 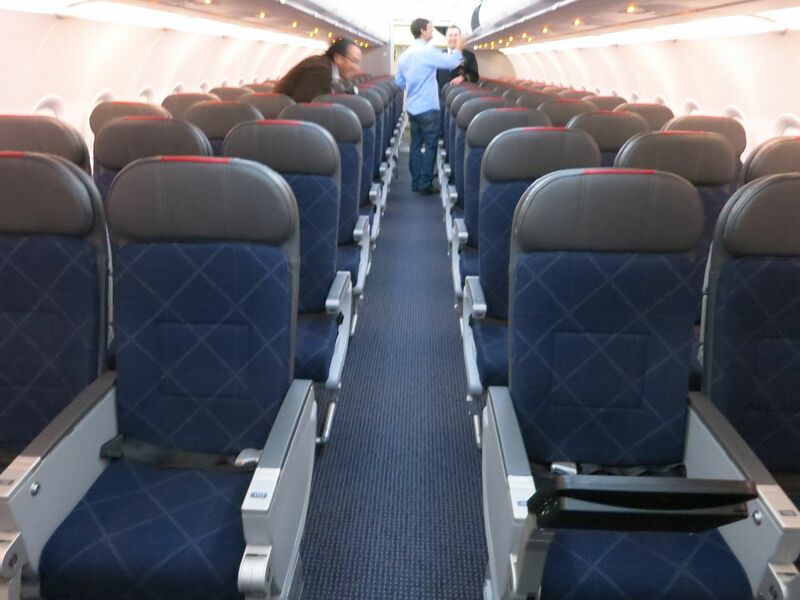 Bottom-line: It’s a really gorgeous new plane, and I can’t wait to fly it! Award availability gets quite good, too, once the number of flights ramps up in the spring. And it’s a great way to include a flight with New York stopover coming back from Europe, or LA/San Francisco stopover coming back from Asia. Thanks for the sneak peek! Availability for one passenger is fantastic, but I can’t find a single flight with availability for two saver awards in the same class. “The killer app” – first class is not an “app”. An app stands for computer application? 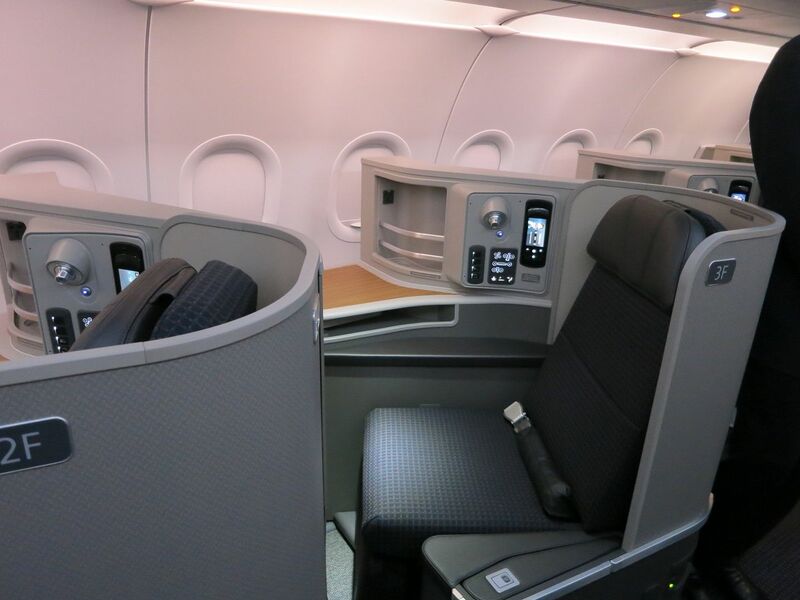 What are your thoughts on AA’s upgrade policy on this route given that United and Delta now have policies that severely restrict access to these cabins to those that have upgrade certificates? I know this is a difficult question since AA’s entire upgrade policy is in question (moving away from 500 mile sticker upgrades) given the merger with US; but wanted to hear your thoughts on this route specifically. 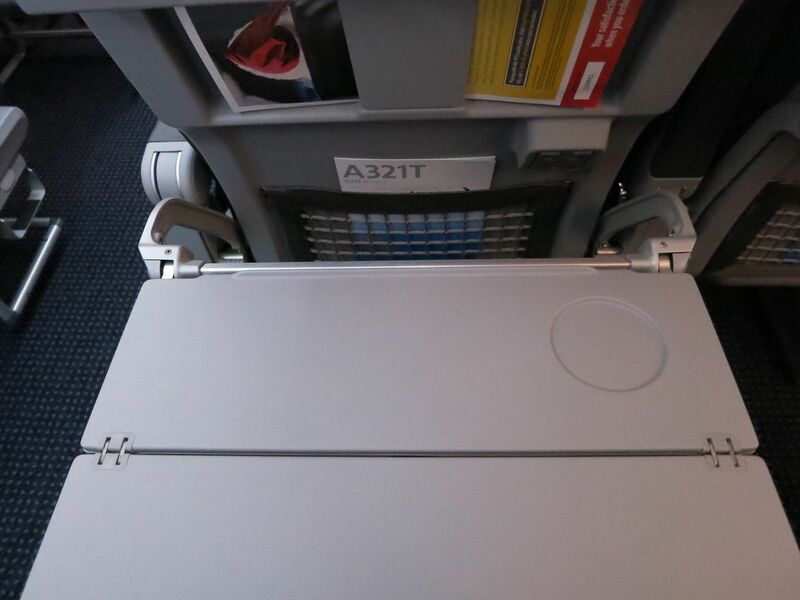 So….. What happens on these planes when somebody in the window seat needs to go to the bathroom and the person on the aisle has converted their seat to a bed? @Josh, you step over them, just like you would on any other plane with this seating configuration? @Andrew – I guess? It’s a little different having to step over a bed that’s the full width of the seat though. Just seems odd to me that those seats are generally on longer flights so somebody might be blocking you for hours and hours at a time. I guess those planes aren’t wide enough to support the 1/2/1 configuration that some other airlines use in business class so then every seat has access to an aisle. That’s the new AA policy. It’s like a companion certificate in reverse. Buy a revenue ticket, or use an Anytime 2X miles award, and take your partner along with you at the Saver level. the updates are certainly welcome, but i cant help but to compare(nature) it with asian airline’s premium cabin services. in short there is just no comparison – asian’s beats american’s by a wide margin. its easy to catch on the hardware side, but the software (service & attitude) lags far behind. 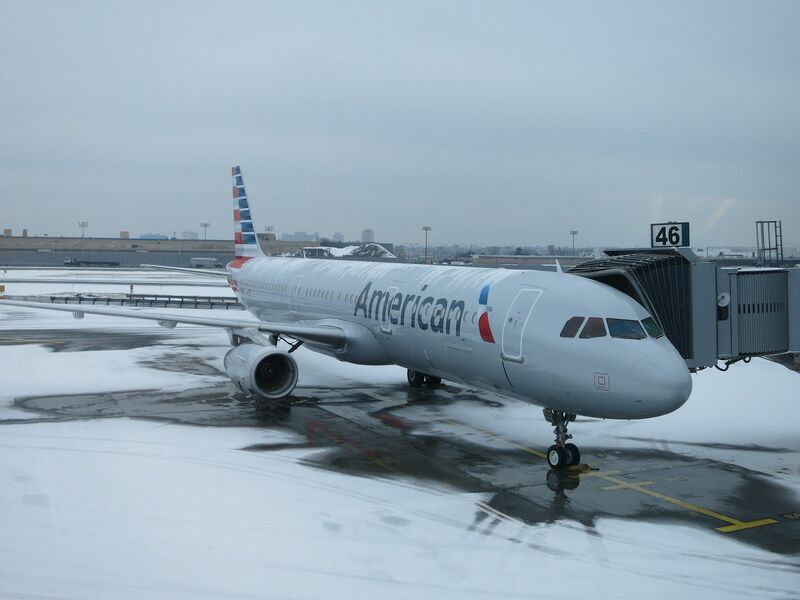 This May I flew long haul on both CX & AA F. frankly speaking I am not happy when AA starts DFW to HKG at all. When it comes to awards, I’d rather be on CX’s J than AA’s F.
@Ty – 10? There were two others there I think. >Here’s Wandering Aramean off in the distance opening an overhead bin, and considering jumping inside. This is so funny. Love you humor! Wonder if they will be able to keep Economy passengers from using FC Lav. That would make it a real FC product. Those coach seats look tiny! Will it have male/ female separate bath rooms. ? The Business seats are going to be almost impossible to get via our hard earned and money spent upgrades with 10 less seats. Also, it is going to be a huge PITA for window seat passengers to get up during the flight. I see this design as a step backwards for American. I’m actually gonna be flying on AA’s a321 in a couple months. It’ll be my 1st time on an A321 so i’m excited. I’ll be sitting in Main Cabin Extra(premium coach). 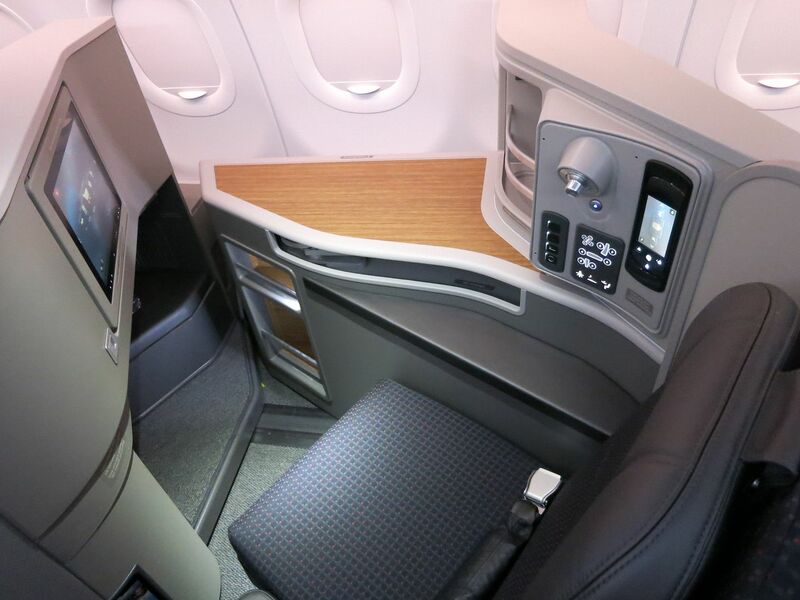 Some pre flight info for the A321’s Main Cabin Extra section: seat pitch is 35-37″(the usual 4-6″ pitch increase) and the recline is 6″(2″ more recline than in coach). I’ll give you the verdict after my flight.